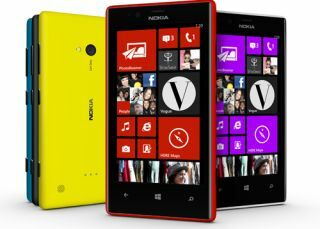 Nokia Lumia 720 and 520 add colour to Windows Phone 8 range | What Hi-Fi? Nokia has expanded its colourful range of Lumia phones with the launch of two new Windows Phone 8 handsets, the Lumia 720 and the Lumia 520. The two new models feature plenty of features as seen on the flagship Lumia 920, despite the Lumia 520 being the most affordable Nokia mobile yet to sport the latest Windows Phone 8 OS. Announced at MWC 2013, the two new phones come in a choice of five colours, red, white, blue, yellow and black, and they are due out in Q2 2013 in the UK after launching in Q1 in selected territories in Asia. Looking similar in design to previous Lumia models, the Lumia 720 has a 4.3in screen, 6.7MP main camera and a front-facing camera, Snapdragon S4, dual core 1GHz processor, 512MB RAM and 2000 mAh battery. The 4.2in screen's resolution, at just 800 x 480, is a little disappointing, though this is a midrange smartphone so perhaps no huge surprise. The Lumia 720 has an 8GB internal memory, though this can be expanded thanks to the microSD card slot, which can support cards up to 64GB. Free SkyDrive cloud storage is also on offer. As with other Nokia models, wireless charging is available, though you'll need to buy the necessary charging pad accessory, and there's Bluetooth 3.0 and NFC built-in. There's Nokia Music and Nokia Mix Radio on board, plus an internet radio and support for AAC, MP3, WMA and plenty more file formats and codecs. The Nokia Lumia 720 price is expected to come in at around 249 euros, so expect similar in the UK. The release date is Q2 for the UK. The Lumia 520 meanwhile is the cheapest Windows Phone 8 phone yet from Nokia. The 4in screen has the same 800 x 480 screen resolution, same Snapdragon S4 1GHz processor, but a smaller 1430mAh battery. The storage capacity is the same as on the 720 – 8GB plus a microSD card slot – and there's no wireless charging capability or NFC support. Nokia Music, Nokia Mix Radio, Bluetooth 3.0 and a 5MP camera are on board, though there's no front-facing camera or flash. The good news is the Lumia 520 is expected to come in at around 139 euros, so again expect a similar figure for the UK price. Nokia also announced that both new Lumia phones would be launching in China, big news for Nokia. Also new were entry-level phones, the Nokia 105 and Nokia 301, and an expansion of the Nokia HERE 'location experiences' brand, which pulls together maps, satnav and other location features, offering the apps to non-Nokia Windows Phone smartphones. So expect to see Nokia's HERE Maps, HERE Drive and HERE Transit popping up on other WIndows Phone mobiles. We're out at MWC 2013 in Barcelona, so look out for hands-on reviews of many of the new phones and tablets launching this week.